The land and sea meet in a titanic struggle for dominance along the Sonoma, California Coast, and few places reveal the amazing landscape of this battle better than Bodega Bay. Use the elevation of the high cliffs to capture the timelessness of the Pacific and the incredible formations and shapes it has carved from the edge of the continent. Follow the many trails to the sand dunes and wild beaches for an entirely different perspective of the sea and the land. As you travel north from Bodega Bay along the Coast Highway, Route 1, the shore becomes a series of beaches, with jutting headlands separating one from the other. The next major stop north is Sonoma Coast State Beach. Here is where the Russian River empties into the Pacific. The riverine environment presents a completely different nature photography opportunity, which transforms into a seaside setting. Ospreys, brown pelicans and other seabirds populate the area. Goat Rock, standing at the mouth of the Russian River, is both a fascinating subject matter and backdrop for your amazing seascapes. Follow the Sonoma Coast Trail south from Goat Rock to explore more of the bluffs, beaches and fern-lined ravines of the area. Walk inland on the Pomo Trail and you’ll find yourself in a redwood forest. A few miles north of the mouth of the Russian River is Fort Ross State Historical Park. Originally, this was the southernmost location of any Russian settlement, years before California became a state. Fort Ross Cove is another incredible display of seashore, with beaches, windswept cliffs and a landscape twisted and torn by the active geologic forces of the San Andreas Fault. Your next photographic fantasy is truly wondrous: Salt Point State Park. Hope for a day when the fog and mist is rising from the sea, diffusing the sunlight to create magical images of rocky headlands, secluded coves pounded by the surf and coastal woodlands of bishop pines. Salt Point is also famous for its sandstone caverns, or tafoni in Italian. Because the rock is soft, the sea has created a phantasm of openings, projections, ridges and intricate passages. The light and shapes will play tricks with your mind and camera, but you will have the evidence that such a place exists. Approximately 45 miles north of Salt Point is a natural phenomenon that defies all logic. Bowling Ball Beach is so named because thousands of round rocks of the same relative size sit on the sand. Weirder yet, is that there is an equal space between each of them. Strange, but simple in their creation, the “bowling balls” are a much harder type of rock than once surrounded them. Seawater erosion has removed the softer rock and left the balls. Nearby is Point Arena Lighthouse. It’s positioned at the end of a high promontory and makes for a majestic subject matter for your photography. Within a short distance is the Arena Rock Marine Natural Preserve. It is designated as one of California’s Underwater Parks, meaning to photograph this Sonoma Coast fantasy, you must don snorkeling gear to visit the underwater ecosystem around Arena Rock. As the Sonoma Coast was settled, humans discovered it had the near-perfect weather and terrain for growing grapes. Today, the Sonoma Coast is famous for its vineyards, which will provide you with a contrasting photographic fantasy compared to the wildness of the shoreline. The bountiful hillsides of grapes and the neat, relaxing wineries offer equaling compelling landscapes and images of the winemaking tradition. 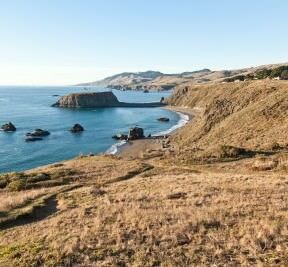 The fantasies of the Sonoma Coast are there to experience and capture in stunning photographs. Your exploration of this region with your camera will be thoroughly enhanced when you join Visionary Wild’s Sonoma Coast Workshop, September 13–17, 2012. This advanced, intensive five-day learning experience for serious photographers will take you to many of the sites and scenes in this PhotographyTalk.com article. Your hosts will be Jerry Dodrill, an award-winning adventure and landscape photographer, who has spent many years living and photographing this part of the California coast, and Justin Black, a well-known photographer, co-founder of Visionary Wild and trip leader.